Recently I got a gecko-related communication from my downstairs neighbor. 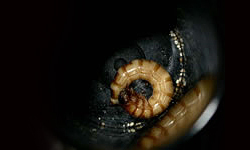 This is not unusual, since I get frequent requests to come down and remove dead crickets from the lamp fixtures or live ones from under the refrigerator. Once, she called to let me know that she’d found Eragon, my big albino leopard gecko, in her linen drawer (I’d been wondering where he’d gotten to). According to the latest message, she’d found a leopard gecko in the basement. When she’d tried to catch it, it ran under the washing machine. There was only one problem: no one was missing! Putting aside that minor mystery, I immediately went down to the basement with my flashlight to search for the gecko. I looked diligently under and behind the washer and dryer. No surprise — no gecko. I needed a plan. How do you find a single leopard gecko in a dark and musty space that hasn’t been cleaned in 30 years (when we moved in)? 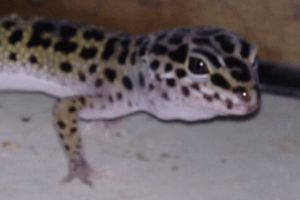 The answer should be obvious to leopard gecko experts: you look for the spot where the gecko poops regularly, as leopard geckos are wont to do (it’s called the “defecatorium”). I figured that if I found that sweet spot, I would have a better idea of where to look for the gecko. I wasn’t really expecting to find anything, but I did locate the spot in the corner near the work benches. I left a bowl of water there and searched the area again. 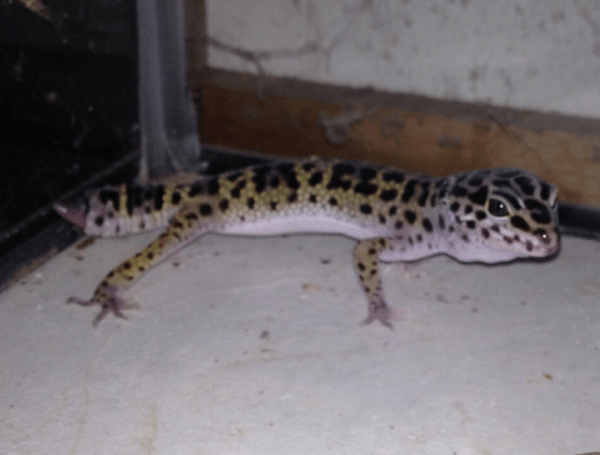 For the next week or so, my husband and I went down to the basement at all times of the evening and night, armed with a flashlight to look for the mystery gecko. I tried to memorize the location of all the droppings in the defecatorium (ugh) in order to detect whether anything new had been deposited. Meanwhile, I did some research. I went back through my gecko “studbooks” to determine the last time that I had lost a gecko. What I found was incredible! 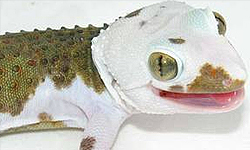 During the summer of 2013 –two years ago– I lost a hatchling, a normal gecko from a boldstripe x Tremper albino cross. This gecko had been living in my basement for 2 years! Despite all my searching, I still didn’t really think I’d actually find the gecko, much less succeed in capturing it. I left a plastic container in the basement just in case there was a new sighting. 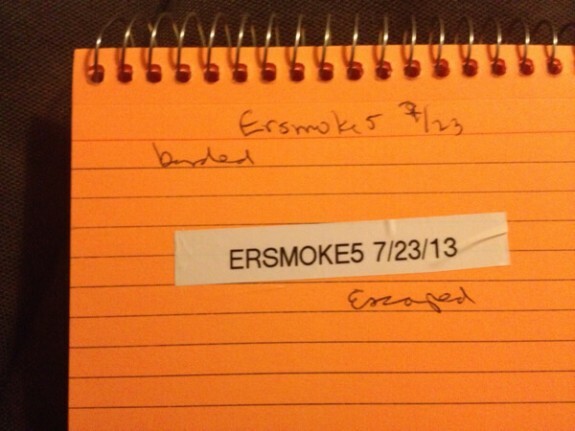 Five days after the original communication, the call came again. My neighbor had encountered the gecko and managed to trap it in the container! We went down to retrieve it and sure enough, there was a leopard gecko matching the description of the hatchling in my studbook. She was on the small side, looking to be in the neighborhood of 20-30 grams and had recently lost her tail which was just starting to grow back. “Ruth”, named for my downstairs neighbor, is now in one of my extra cages. She has every comfort in the world –fresh water, hot and cold running super worms and crickets, calcium with vitamin D3 (I’ll give her a few weeks to stock up and then remove the supplement and just dust the feeders) a humid hide– everything except her freedom, which I really don’t think she’ll miss in the long run. So far, she’s eaten everything I’ve provided and left me some nice “presents” in one corner of the enclosure. Several times a day, I lift up the hide and talk to her so she can get used to me. Ultimately, she will probably go to the Gecko Sanctuary to be socialized and adopted out. ♦ Never give up! I’ve had geckos missing for a few hours, days, weeks or months, but a 2-year absence is a first. 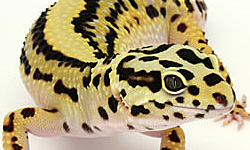 ♦ Leopard geckos are very hardy. Compare this geckos’s story to the numerous posts on forums about geckos that aren’t eating (“my geckos hasn’t eaten for 3 days and I’m afraid she’s going to die”). I’m amazed that this gecko survived 2 New England winters in the basement and that it doesn’t have MBD. Either the escaped crickets were well gut loaded, or there’s an unsuspected source of calcium in my basement. ♦ There can be a positive side to multiple cricket escapees in addition to entertaining the cats. ♦ “Freedom’s just another word for ‘nothing left to lose'”: So, is a 20 gallon long cage better or worse than having the run of a cold basement? Ruth isn’t telling, but you can probably figure out the answer. I hope anyone who is dealing with an escaped gecko has the same good fortune that I did. wow, that’s incredible. I’m glad you found the little guy…and in such good condition. Great post. I wonder why she wasn’t discovered sooner or appear sooner. I wonder if losing her tail changed her pattern of behavior in some way. I certainly had no idea she was there! This is really cool. I am glad she is alright. I would be interested to see some pictures of her all fat and happy! Also, I was wondering the same about her tail and a possible change in behavior leading to her being caught.